Explanation: Why is the Sun so quiet? As the Sun enters into a period of time known as a Solar Minimum, it is, as expected, showing fewer sunspots and active regions than usual. The quietness is somewhat unsettling, though, as so far this year, most days show no sunspots at all. In contrast, from 2011 - 2015, during Solar Maximum, the Sun displayed spots just about every day. Maxima and minima occur on an 11-year cycle, with the last Solar Minimum being the most quiet in a century. Will this current Solar Minimum go even deeper? Even though the Sun's activity affects the Earth and its surroundings, no one knows for sure what the Sun will do next, and the physics behind the processes remain an active topic of research. The featured image was taken three weeks ago and shows that our Sun is busy even on a quiet day. 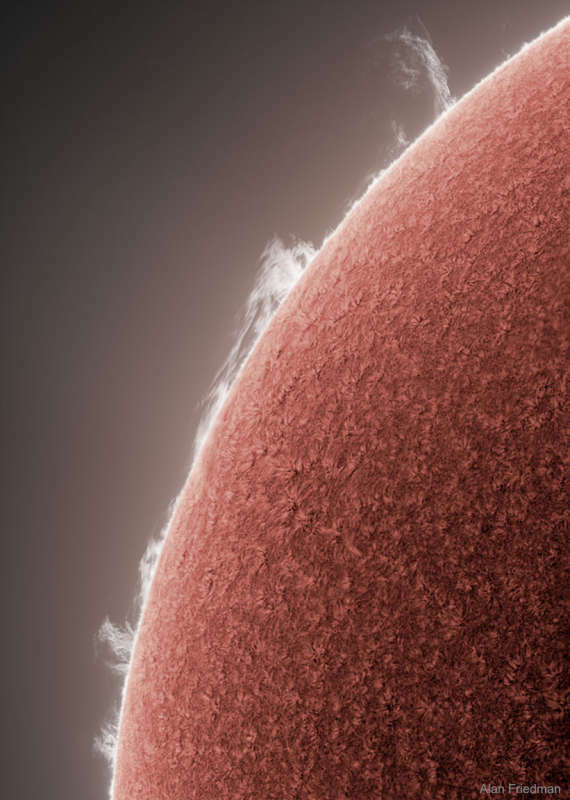 Prominences of hot plasma, some larger than the Earth, dance continually and are most easily visible over the edge.